The comparisons between the animations and their contemporary remakes make for interesting commentaries, but that’s not the aim of this here essay. Rather, it’s the fact that these remakes are based upon their Disney counterparts, instead of the often forgotten or unfamiliar source fairy tales, that is interesting. The themes and morals of the European tales upon which Disney has built its legacy differ sharply from the subsequent animated adaptations, and it’s arguable that these dissimilarities are characteristic of the respective historical periods and cultures of those responsible for these stories and films. 3- as is the cultural lens through which we see this (American popular culture). This comparison is harder, however, much more interesting, when done between the Disney animations and their literary sources: the time frame is much larger, the mediums and the cultures they originate from are different. This essay, the first of a series, aims to do just that, beginning with the Little Mermaid. When the movie the Little Mermaid came out in 1989, it enchanted thousands of little boys and girls, myself included, and at the same time gave us a glimpse into a world that was not often shown in popular culture: the sea, and its inhabitants. Beyond the enchanting songs and the memorable and winsome characters of the movie, the story also held a mirror to our society through the viewpoint of a third party, a young idealistic girl named Ariel. As is common for movies produced by Disney, this one deals with themes and lessons that are interesting to compare with the ones promoted by the source fairy tale. A very quick glance reveals that they are somewhat dissimilar, starting with the manner with which they approach the subject of actions and their consequences. While this chasm is, in and of itself, interesting to note, it is more so because of what it reveals about the ideology of Disney movies: what makes them so interesting is how they constantly change the message and lessons of the fairy tales that inspired them. The aim is to understand the reasons behind those changes. More specifically: what can we make of the ideology of Disney and the reasons for its impact on society through the salient morals of The Little Mermaid fairy tale, as well as its narrative structure? Before delving into said ideology, as well as the place of fairy tales and morality in modern and past societies, it would be interesting to, first and foremost, focus on comparing both stories (including the characters, settings, and their significances); after which the act of transformation, as well as the thematic core of both stories (being human and being other than human) will be explored. Bear with me, friends. The Disney version of The Little Mermaid paints an almost idyllic portrait of the under-the-sea world: in the very first shots, viewers are accosted by lush colors, jaunty music, graceful and inviting sea inhabitants. Similarly, Andersen offers a compelling glimpse into the world the mermaids live in; the very first paragraphs of the story, in fact, play out like some ad for an exotic vacation destination: “Now don’t suppose there are only bare white sands at the bottom of the sea. No indeed! The most marvelous trees and flowers grown down there…” (Andersen, 48). On the surface, both stories are very similar: they deal with a young girl who yearns to discover the world above water. The surface where we humans live is described by Ariel’s father in the movie (the ever-dramatic, ever-aggressive King Triton) as a barbaric place where mermaids and other sea-beings are hunted and persecuted; Ariel, on the other hand, pictures an endlessly fascinating place, full of bewitching oddities. In the fairy tale, while the connotation is just as pejorative (humans are fearsome and to be avoided at all costs), there is a nuance: the mermaids are allowed to go to the surface once they come of age, that is to say fifteen years old. It’s as if a certain type of maturity was needed in order to accept and understand this other world. But we could also look at it this way: fifteen year-old mermaids are certainly more attractive than eight or nine year-old ones: keeping in mind that these mermaids, first and foremost, have been considered dangerous enchantresses in many cultures, perhaps this age limitation is both a hypocritical and unspoken stratagem. Whether knowingly or not, once they come of age, they have finally matured into the creatures that have been luring humans under the sea of eons. Back to Andersen: the mermaid falls in love with a prince for whom she sacrifices everything, including her family. To do so, she makes a deal with the Sea Witch who gives her the ability to walk on earth and with it, the opportunity to try attaining her goals — but of course, at a price. In both stories, the mermaid sees herself relegated to a sort of sister figure for the prince, who does not recognize her as the one who saved his life during a shipwreck (as implausible as this has always sounded, to be honest). Moreover, the relationship between the prince and the mermaid is threatened by his potential interest in another woman; this is where both stories diverge. In the fairy tale, the mermaid doesn't end up with the man of her dreams while in the movie, their love prevails and the other woman (Ursula, in her foxy disguise) is uncereminiously shoved out of the picture. Seeing as the prince’s love is the mermaid’s sole aspiration and the entire point of the story (reductive, yes, which I’ll come to soon enough), this is a major deviation between both stories. These differences become even more eloquent when we inspect the characters. The first thing that catches the eye is that in Andersen’s tale, they are nameless. It puts them all on the same level, and makes their ensuing connotations universal: this story could be anyone’s (although more likely human than mermaid). In the movie, however, names are given out far and wide, imparting the same characters with personality, but more importantly, individuality. The consequences of this difference will be explored in just a few. In both stories, the mermaid is the youngest of many siblings: she stands out from them, mainly through her distinct personality; this is shown differently in the fairy tale and in the movie. In the latter, the sisters are vain, slightly judgmental and unable to relate to their youngest sister while Ariel is curious, mischievous and strong-willed. In the source material, the mermaid is described as a quiet, introverted and slightly eccentric young girl who asks philosophical questions where her older siblings and the rest of her family accept things as they are, preferring not to challenge or even pay attention to the status quo. Sidekicks such as Flounder, Sebastian or Scuttle have been added by Disney where they did not exist in the fairy tale, and in contrast, characters such as the venerable grandmother from Andersen’s story have been completely written out of the Disney film. These are not inconsequential changes: the figure of authority in the story is the grandmother who represents wisdom (although she gives the mermaid rather questionable advice on how she should act and think, in my personal opinion), while her father is practically nonexistent. The women of the story are in charge, from the mermaid, her sisters, their grandmother, the Sea Witch all the way to the woman who takes away the prince she is so desperately in love with. In the Disney movie, temperamental, imperious King Triton becomes the figure of authority: the focus has shifted completely, from matriarchal to patriarchal, and this tweak, while small, makes a rather pronounced statement about Disney’s views on the family unit. The Sea Witch is another character who undergoes a slight, but ultimately powerful transformation. In the movie, she is the villainous (and positively fabulous) Ursula who takes advantage of Ariel through the one thing that makes her so unique: her beautiful voice. Ursula once again takes advantage of her when she transforms herself into a beautiful woman and hypnotizes Prince Eric into nearly marrying her (this would allow her, in a roundabout manner, to gain the underwater Kingdom, knowing that King Triton would trade himself in place of his daughter in the event of the unsuccessful pact the latter has signed with the witch. It's complicated but you know what I mean, we've all seen the film). In the story, the nameless Sea Witch is a neutral character who makes a very fair trade with the mermaid: something for something, which in this case is the chance to win over the love of her life and become human, in return for physical pain and muteness. It’s the deal that is weighty and frightening, not the character herself, whereas in the movie, everything is shifted on the character of Ursula, and her intentions. Prince Eric is quite possibly the one who has been most transformed, and therein lies one of the greatest sources of digression between the literary and cinematic versions: in the tale, he is an oblivious, shallow and rather insensitive young man with whom the mermaid falls in love, before she has truly gotten to know him. Of the countless fairy tales I have read, the Prince remains one of my least favorites, even if he is not, objectively, the worst. Everything in the story has happened because of him, but he remains blissfully unaware, and unaccountable (it is not like he asked to be the object of affection of a puerile and sheltered girl. But something about his cavalier attitude, throughout, rubs me the wrong way.) By shocking contrast, Prince Eric stood out for many, when compared with past Disney princes who were deemed uninteresting and too one-dimensional (see Snow White and Cinderella’s respective princes). Eric is made to be so desirable, so handsome, so charming, that even though the moral of the story is still skewed, he almost makes us believe that he is worth it, and almost distracts from the notion that this type of love is toxic, and dangerous. Almost. Through the literary adaptation process, it’s become clear that the characters of the fairy tale have been given intentions and inflections that have changed them completely. But it also makes another statement: the addition of these playful characters and the omission of one of the more placid one shows a strong desire to add whimsy and distraction in a story that was quite sober to begin with, which makes me ask the obvious: why? The changes needed in order to make a story more lighthearted in tone are usually for two reasons: either to conceal uncomfortable and valid truths that one does not want to endorse, or else to make something more palatable to an audience that is not believed to be mature or strong enough to handle the truth. It’s not hard to see how both motivations have fueled said changes: after all, in the original version, the price the mermaid has to pay, for the pair of legs she is granted, is the unabating sensation of standing with bloodied feet on broken glass. Her sacrifice is in vain because she cannot become a mermaid again, has lost her family, has not managed to win the affections of her prince, and, heartbroken, throws herself into the sea before being transformed into an ethereal being destined for a greater afterlife. The film softens up this gut-wrenching story by not only making the ending happier (Ariel marries Eric, gets the support and forgiveness of her family and stays human), but by also taking the edge off the difficult details: Ariel only loses her voice, and the rest of her transformation is seamless. This does not only alter the facts and ending of the story: it alters the story itself — completely. The tone is different, the themes are different, and we are left with seemingly widely diverging narratives. Before delving any further in the analysis of the effects on both stories, let’s take a moment to acknowledge the contexts in which the stories were fleshed out respectively by Disney and Andersen, by taking a look at the symbolism. The core of these are the figures of the Mermaid, and that of Man. As is often the case with mythological creature, mermaids have been frequently shrouded in mystery and systematically kindle fascination. It is not surprising, then, that Andersen chose to focus one of his most singular stories around merfolk. It is not, however, the first time that mermaids have been depicted in literature; throughout history, they've been at the center of tales describing their perilous and formidable charm. Yet, unlike in Andersen’s story, merfolk haven’t always been portrayed so tamely. There is a world of semantic rifts which has contributed in the confusion people sometimes have regarding mermaids and similar creatures. Around the world, there are countless denominations surrounding them; in French, for example, mermaids are commonly referred to as “sirènes”, but they have also been named “ondines”. The distinction is clear: a “sirène” is a half-bird, half-human woman who makes preys out of sailors and other humans by attracting them with her enthralling voice, and often causes shipwrecks and other tragedies, a bit like the Harpy. Similarly, in English, mermaids, sirens and undines are sometimes confused and/or interchanged even though they don’t exactly refer to the same thing: undines are spirits of the water who, like nymphs, look like women, but have no souls. Sirens are malevolent half-bird, half-human creatures who intentionally cause accidents (see Homer’s The Odyssey), and have beautiful voices with which they attract sailors to their watery deaths, while mermaids, the most commonly known creatures, resemble women with fish tails whose connotations shift: they can be either well or ill-intentioned towards us. While in the fairy tale and its adaptation, the wariness between humans and menfolk has been touched upon, none of the mermaids have been given these terrible powers of seduction: in fact, Andersen mentions that the sisters of the little mermaid try to go unseen by sailors when they go to the surface for fear that they would inadvertently cause their deaths. They possess the powers, but choose not to use them, bringing them closer to the benign “ondines” than the “femmes fatale” overtones traditionally tacked onto mermaids and sirens. Andersen’s tale is often credited for popularizing the figure of the mermaid, but what many overlook is that he himself made a very personal interpretation of these creatures, giving them favorable attributes they did not possess in established mythology, in order to better convey his message to children. This is exactly what Disney has done to countless fairy tales: namely, using slightly modified traditions in order to make them fit in the panorama of morals it endorses, throughout its films; and it is upon realizing this, the more apparent these modifications and alterations appeared to me, that I became obsessed with studying not the how, but the why. An artistic interpretation can be done in many ways, and for many reasons: to beautify, to fascinate, to capture the attention, or in order to make a story one’s own, through the lens of the artists’ own worldview. It can also be done to modernize a story that is considered outdated. If Andersen interpreted mythology by combining the charm and beauty of “sirènes” with the mystery and benevolence of the “ondines”, it was, among other reasons, to make his protagonist more disarming and spellbinding, which would in turn give his tale an enigmatic quality which would benefit his moral: if the little mermaid had everything one could ask for, namely a charmed existence, why would she be willing to sacrifice it away? Disney, in the same way, borrows and changes Andersen’s story, which one could see as the natural process of interpretation and retelling that every work of art inevitably goes through. But it would be downright naive to things that this was not an intentional and studied process from Disney. Humans, (and subsequently, humanity) are the second theme around which the story revolves, and surprisingly, it undergoes a process that is just as riveting. Although we are far from fantastical, we humans have occupied a place in literature over the centuries that’s been just as central as those who are. While they diverge on many aspects, both the film and the fairy tale handle themes of otherness, subjectivity and prejudice. Interestingly, the perspective taken in both is that of the creatures of the sea (mermaids in the story; mermaids, fish, seagulls, crabs etc. in the movie). Humans, and the earth they inhabit, are the exotic things shrouded in mystery, not vice versa; what is more, it’s the mermaid who gets transformed into a human whereas in popular culture, it’s the other way around. Humans are transformed into creatures (see Franz Kafka’s Metamorphosis), and they have to explore and deal with a foreign culture and the subsequent unknowns. This reversal is fascinating, added to the fact that we are considered, by the mermaids in both stories, as strange, frightening and endlessly compelling beings, similarly to how we would look upon them. This goes to show that what is considered “Other” is never truly set in stone, and that the viewpoint chosen has a powerful effect on the resulting narratives. This age-old awareness opens up a debate that is equally stimulating and troublesome: on the one hand, we have the chance to revisit our world through the eyes of a stranger. Disney and Andersen’s mermaids treausre us, sacrifice everything to have lives resembling our own. Andersen’s mermaid is delighted by natural phenomena such as the sun, the clouds, the snow. Ariel revels in the objects that we would normally trivialize, and hoards them away in a secret cave: in fact, the way she incorrectly uses them often leads to moments of endearing hilarity in the movie (such as the fork hair-brushing scene, or the way she gazes through the wrong end of a spyglass witht the confidnce of one who’s been doing this all her life). Let us suspend our disbelief and accept that this world exists (I already half do). While all of this underlines the chasm between two societies that don’t understand each other, it also underlines the potential in this chasm: in other words, in it, I saw a beautiful metaphor for the way we could reevaluate our world, truly see and appreciate it in the same way that a stranger would. For all we know, we could also be making erroneous uses of shells, sand or other things that constitute everyday life for mermaids, and we may look just as ridiculous to them as Ariel did when she misused the fork. In short, this story highlights the notion of communication through its very absence, giving an unspoken account of how it would benefit cultures who stand at odds to harbor open-mindedness. This possible dialogue is threatened by prejudice: in both stories, humans either do not believe in the existence of mermaids, or are terrified by them when they do. In the same way, save for the main character who is less afraid, the mermaids are guarded when it comes to Men. King Triton is perhaps the figurehead of this stance: he is very explicit about his views (that memorable smashing of his daughter’s hidden collection). Although there is some truth to his attitude (humans can be brutal, heartless and they do fish abundantly), his xenophobia is frightening. It could then be said that it is more by rebellion, rather than pure fascination that Ariel decides to leave the maritime world. The mermaids in Andersen’s tale do not dare approach the shore when they get to the surface, and hide whenever they are at risk of being seen. Only the youngest mermaid dares to break this cycle of mistrust and in this manner, she represents a willingness to adopt a different mentality: she has a deep desire to confront and learn what she does not know, even if it frightens her. It could be that the transformation from mermaid to human is so painful because it is a metaphor for the sheer difficulty that is walking in another person’s shoes and trying to understand them. This, to me, is evidence of a moral that could be understood in many different ways, which I’ll get to in a bit, but from which one particular element emerges. The mermaid, who can easily be seen as more ambitious and open-minded than her sisters suddenly appears more capricious in this light. In fact, she begins to sound like a fickle and privileged young girl who can’t be satisfied with what she has. Disney makes a heroine of her, one who triumphs on her errors and whose dreams come true, while in Andersen’s story, she pays for it with her life. And this seems harsh; she isn’t the first to have behaved this way (we’re back on that idea of subjectivity): everyone, even the most blessed, wants something they can’t have, dreams of better things, and/or feels that something is missing from their lives. Why should Andersen’s mermaid be an exception to this? Who hasn’t dreamt, while watching The Little Mermaid, to live in her colorful underwater world? Who hasn’t, at some point in their childhood — or even adulthood, to be honest — gladly wished to trade two legs for a lovely fish tail and the freedom that comes with it? I know I certainly did. All this pretty talk finally brings us to the themes of morality which, between the film and the fairy tale, changes significantly. While it may be interesting to focus on what makes the respective stories of Andersen and Disney so different from one another, perhaps it’s just as intriguing, if not more, to study the nuanced similarities between both. Let’s look at them individually, before bringing them together. We’re supposed to perceive this as a sign of maturity, in the same way that today, an independent youth leaving their young-adulthood behind would become increasingly uninterested in transgressing laws and chasing impulsive freedom. The little mermaid is the only one who never quenches that thirst, and goes as far as making a dangerous and imprudent pact, sacrificing in the process things of the utmost importance (her family, status, security, identity) for a cause with an uncertain outcome. If we follow this logic, then, the prince marrying another women is a sort of punishment for having acted foolishly. I find it hard to believe that Andersen would condemn love itself: many of his most beautiful works revolve around love in all its forms (platonic, maternal, fraternal etc.). What I rather think he condemns is the means through which the mermaid intended to obtain it. Looking at this story the second way, however, upends it completely: it may be that in showing the initiative of the little mermaid to seek more than her sheltered and privileged life, Andersen may, in fact, be celebrating this very ambition. Maybe the indifference of her sisters and the prejudice and ignorance of the rest of her family toward humans are, in reality, something that the author criticizes deeply. This would explain why, in his story, he exonerates the little mermaid after every “wrong”: when she sacrifices everything she owns for the prince, her sisters sacrifice themselves for her to save her life. Instead of committing murder (of the prince and his new wife), she sacrifices herself again, and she ascends to the kingdom of heaven. He may be showing that however it may have happened and whatever the pitfalls, the little mermaid lived a much more fulfilling life than her sisters ever could imagine. So what do we make of these contrasting approaches to Andersen’s story? Following in the tradition of classic French authors Jean de la Fontaine, Charles Perrault and the Countess of Ségur, who wrote stories for children with conspicuous life lessons, The Little Mermaid is a model example of a cautionary tale, in which the two aforementioned interpretations of Andersen’s story come together as follows: there should be moderation in all areas of life. The same can be said about ambition, which is necessary but should not be unbridled, or about love, which is essential to life, and is beautiful when it is unconditional, but should not imply imprudence. Sacrifice is, last but not least, an admirable thing, but should not be done blindly and selfishly. Although one could come to the same findings upon doing a superficial review of the moral in Disney’s version, the truth is that both endings are remarkably dissimilar. Not only is the following observation rather obvious when studied closely, but it explains much of what constitutes the gap between the source materials and the animated film versions that followed: with each era of Disney movies, a certain sets of values have been subtly endorsed, and have reflected on the society of the time, which we’ll see in more detail in just a bit. Similarly to the protagonists of the movies of her era, Ariel is eager and stubborn. Unlike Andersen’s nameless mermaid (read: nameless characters are universal and relatable), Ariel has a name, and a rather uncommon one at that. Her motivations are painted in a much more clement way: from the very beginning of the film, it’s clear that she is original, special, and unlike her well-meaning but superficial sisters, knows what she wants from life. The hotheaded King Triton is depicted as a father profoundly motivated by his misguided judgments, and consequently, Ariel becomes the misunderstood and smothered youth. Many children of that generation have probably felt that way at some point regarding their own parents: I have absolutely no doubt that making Ariel the underdog who triumphs over her obstacles contributed in the film’s success with young audiences. The emphasis is put on the favorable consequences of following one’s dreams, regardless of the sacrifices they may entail; the hindrances Ariel encounters only contribute in reinforcing the martyr image she’s been given. At the end of The Little Mermaid, her father has realized that he was “wrong” and gives her his blessings, similarly to many movies of the era, where parental figures were relegated to the role of figureheads, who answered to the needs of their children, while letting them make mistakes along the way. For Andersen, conversely, there are grave consequences to disregarding the wisdom of the elders. The fairy tale teaches us that every sacrifice has a risk; the movie tells us that each sacrifice carries its own reward. It is, then, not surprising that in order to convey this message, Disney gave neutral or unimportant characters inflections they did not necessarily have in the first place. Ursula is made to appear so evil that it almost distracts from the fact that it is Ariel who came looking for her and made the deal. Her sacrifice (the loss of her voice) is so much more inconsequential, when compared with the one she makes in the fairy tale, that is almost mitigates the horrible nature of the agreement, regardless of the terms. The fact that Prince Eric is hypnotized by Ursula, and is thus helpless in his shunning of Ariel’s love, is a change that makes the tragic original story more palatable for children who watch the film. Not only is it not Eric’s fault that he almost marries someone else, but it is not Ariel’s either. By shifting the control of the entire situation to an exterior force (dark magic), children don’t have to face this harrowing life lesson: that however much one may want something, things don’t always turn out in one’s favor, and that love is not always reciprocated, no matter how hard one tries. The entire connotation of the story is consequently changed: Ariel is innocent, Prince Eric is a pawn and Ursula an evil witch, while in Andersen’s version, the prince is indifferent, as many love interests can be, the mermaid is not enough for him to love her, as many of us aren’t, in relationships, and the woman he marries turns out to be the perfect one for him, which sometimes happens in real life. One could argue that Disney chose to tone down the fairy tale, as it has done so many times before because children would be traumatized, but this alone does not seem convincing. This prompted, in me, the following questions: does the chasm between the morals of Andersen’s story and Disney’s The Little Mermaid say more about our current society, as opposed to that of the 19th century (when the story was written), or does it say more about the monumental influence Disney has had on children and society, and its power to manipulate stories to the point of almost erasing the original ones? Is this an influence that was unforeseen, or is it the result of a careful study of the temper of the times, and what children want and/or expect to see? I mentioned above that every artistic process undergoes a certain degree of modification over time, which is perfectly normal; in some way, Disney has done just that. Andersen himself has managed, for almost a century, to confuse and nearly make us forget the image of the half-bird, half-human creature in popular culture with his romantic take on mermaids. It could be argued that Disney has only pushed this connotation a bit further by giving us a spunky and multi-dimensional heroine more conformed to the 90’s than Andersen’s demure mermaid. But to attribute the massive success of Disney movies to this reason, and this reason only, would be to set aside the notion of ideology, which has made Disney a creative icon. A comparative overview of the last century in the United States and major Disney movies makes this very apparent. The 1930’s and 40’s were scored by many a bleak events, including the Great Depression of 1929, the Second World War, and the furthering of many reprehensible social movements (worldwide xenophobia, segregation and antisemitic sentiment). On the brighter side, this era saw the flourishing of many already established landmarks in popular culture, (film, comics and radio, among others). During this era, Disney produces movies like Dumbo (1941) and Bambi (1942), that promote strength, family values, and courage, the latter of which would have been needed at the time. The sexual liberation and civil rights movements kindle the United States in the 1950's and 1960’s; it’s no surprise that during that time, Disney chose to produce movies whose themes revolved around dreams, hope, imagination and escapism: Cinderella (1950), Alice in Wonderland (1951) and Peter Pan (1953) being some choice examples. Marked by very assertive dogmas regarding communism and liberalism, the Reagan-led 80’s bolster the golden age of action movies, with iconic, testosterone fueled performances from Schwarzenegger, Van Damme and Stalone; while the 90’s, buoyed by rave culture, grunge counterculture and the reactionism of Gen-Xers, among others, results in films where independence and marginalism are to be protected at all cost. On a purely administrative level, the company undergoes many changes as well: annual movie productions are almost tripled, turning Disney into an industry behemoth, and guaranteeing it a much greater control on the cinematic landscape. This is a dicey, but ultimately beneficial strategy that greatly increases their turnover. Aladdin (1992), The Little Mermaid (1989) and Beauty of the Beast (1991) are strong figureheads for the company’s vision during this era, showcasing the principles of aggressive individualism, risky and exciting sacrifices, and success; others tout the beauty of opportunism, chance/fate and destinies changed overnight. Even if the outcomes are terrible, the emphasis is put on the initiative and courage of having tried. Every single movie fit into its era like a puzzle piece. Case in point: I don’t much see the rather cloying Dumbo having the same level of success, if it premiered today, nor do I conceive Aladdin being understood/appreciated in the 1930’s. In this context, the changes made from Andersen’s tale to the movie we know so well are understandable, and the moral that is expressed follows suit. The lovely book The Uses of Enchantment by Bruno Bettelheim explores the reasons behind fairy tales’ need to express morals. Do fairy tales truly forge our characters and shape our personalities and worldview, and if not, why do we enjoy them so much? Fairy tales did, in fact, have a strong impact on children over the last few centuries, to the point where they were almost more educational than they were leisurely. But as demonstrated above, the lessons they convey are subjective and can be found very obsolete from one moment to another. 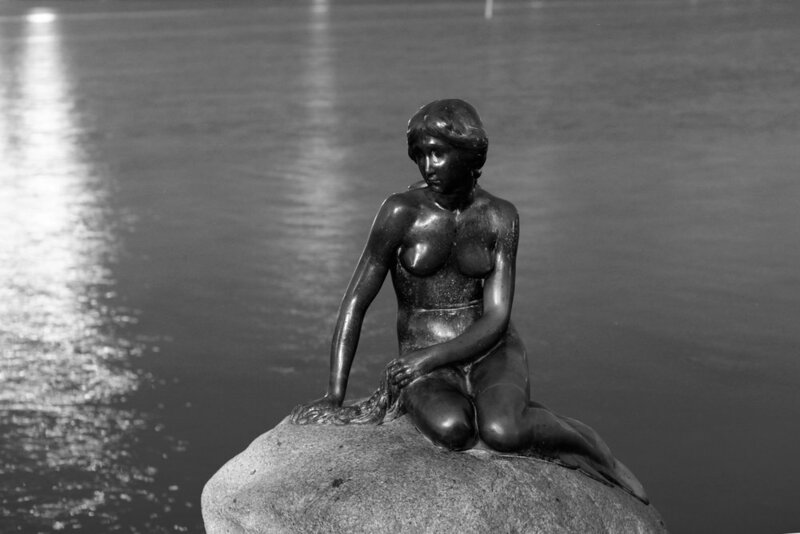 A story that seemed striking and impactful a few centuries ago could be considered harmful and dangerous today, and Andersen’s The Little Mermaid is no exception to this: its attitude toward women (in society, in relationships, in families) is quite derogatory, when one pauses to analyze it. What this process does to a story, in time, is devalue it completely, I believe. Fairy tales, which were once pillars of education have often become examples of how not to raise your children. Disney has an advantage over fairy tales in that it is not fixed in time, like the fairy tales that are locked in the timeline of the people who author them: Disney can make retroactive and strategic decisions on how to portray their adaptations, while the long-dead Andersen cannot. Obviously. I do believe that a conscious effort has been made by Disney to shift and adapt their ideologies to the times, but in many ways, even they cannot escape the potential criticism, down the road: we might look back on The Emperor’s New Groove in twenty years and find it dated and silly (God, I hope not). This constant chameleonic quality makes Disney look fickle and difficult to pin down, but it could also make it appear seemingly (emphasis on seemingly) progressive, modern and versatile. It’s just an illusion, of course, but that is a conversation for another day.